FOR SEYMOUR, BLAIR and LIBERTY. 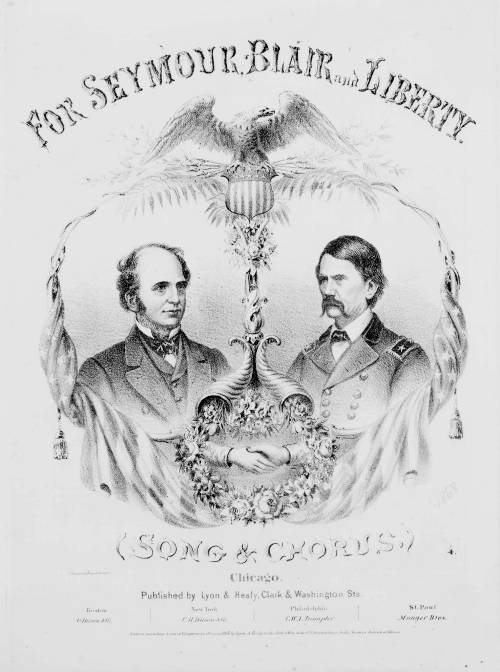 An illustrated cover for a campaign song written for Democratic candidates Horatio Seymour and Francis P. Blair, Jr. Bust portraits of Seymour and Blair are separated by two cornucopias spilling over with flowers that form a wreath around two clasped hands. Above the portraits are vines, olive branches, and palm fronds, the vines circling around to entwine with two American flags below. At the top, an American eagle stands on a shield decorated with stars and stripes.